After a quick briefing with my client, I am about to get in my car when I hear someone calling out “Dlaw, Dlaw” from behind, I turn around and my heart skips a bit, guess who is pacing towards me? Omalichanwa, the Ibo girl that broke my heart in the University. We hug for a few seconds and immediately I get a whiff of her beautiful smell, I am transported to what I would always remember as one of the most beautiful times of my life. I had met Oma at the Food Market on campus and she was the most beautiful girl I had ever seen. The most beautiful flower paled to the sight of her. Her body was specially forged by her maker and her smile seemed to shine like the sun. I had chased this girl all over campus, trying every chivalrous move I knew but all my efforts were futile. I was however rewarded one day she had come to eat and forgotten her wallet. I overhead her mention it to one of our mutual friends and immediately offered her the sole and only 500 Naira note in my wallet. That single deed turned out to be magic, as later in the evening Oma would return my calls for the first time and also accept my BBM Invite. That was the beginning of a beautiful relationship or so I thought. Spending time with her or just hearing her talk was my favourite past time and I would always make time to have her be a part of my day. But all that changed when Oma decided I wasn’t good enough for her anymore and called it quits. According to her, we were just friends and she never had the intention of dating me. Just friends! I had screamed. After having married you and had great grand children in my dreams. After fantasizing about our life together and looking forward to hearing your voice every morning. How many of your friends send you a good morning message every morning and chats with you all day? How many of your friends wants to hold and cuddle you all day? How many of your friends concern themselves with your happiness every day? Friends! It had taken two weeks of binge drinking to get over her and a promise not to allow myself fall in love again. Coupled with days of my heart feeling heavy and countless debates with myself on whether to call her or not. Last I heard of her, she was dating an old school mate of mine and somehow hating her had helped me get over her quickly. All that was however about to be undone. “Hi Dlaw, been a while”. Yes Oma, I responded. Almost stuttering and bringing myself back to reality. Compliments of the season, I manage to add. How have you been? “I am great and it’s s nice to see you”, she adds. “Especially as I am sort of in a fix, My Landlord has sued me and my lawyer is a no-show, I don’t know what to do and the matter will be mentioned very soon”. “Oma, don’t worry, I will offer my services to you pro bono, which court is it” I am quick to add. If I can’t represent Omalichanwa, then why did I go to law school or even become a lawyer for that matter. What would be the purpose of my law degree if I could not use it in a sacrifice of love. So I grab my garb and head back into court, thinking more of Omalichanwa’s waist and the beads that used to be there than the facts of her matter which she is trying to bring me up to speed on. Apparently, Oma’s Landlord had served her a 6 month’s notice 3 months before the expiry of her rent. However, the Landlord had backdated the letter to accommodate the mandatory 6 month’s period of notice and had tendered the back- dated letter in court. Luckily, she had written back to the Landlord informing him of the date she had received the letter and stating she would consider the Notice to begin to count from the date it was served on her. Unfortunately for the Landlord, his lawyer had also commenced the suit against Oma before the expiry of the valid 6 month’s Notice. Piece of cake I figured, I could do this with my eyes closed. Oma’s matter is called and her landlord’s lawyer goes into a rendition of his case. After his submissions, the judge looks at me and asks if I have counter arguments. “My Lord” I begin. “It is the position of the Defendant that this matter was improperly instituted as the Defendant was not served with a valid Notice to Quit…………Due to this position My Lord, we will be applying that the suit be struck out for lack of jurisdiction ”. I make my submissions and to our luck the judge decided to write a bench ruling. “Suit struck out” the judge says and I am pleased to chorus “As the court pleases”. Oma jumps into my arms as we come out of court. Could it be I am now back to being her hero. “Dlaw, you are so nice, you were awesome in court, I am so proud of you”, Oma goes on and on. Just hearing her call my name is music to my ears and all my hate for this girl who broke my heart just seems to thaw, like Her Volcano just erupted in my Artic region and all the ice was melting away. She was the Tinashe to my Davido, the Annie to my Tuface, the Bee to my hive. Maybe it was the taste of victory that encouraged me to jump or walk ahead of my time but I felt this would be a good time to ask Oma out again. “So Oma dear, would you like to have dinner with me”. The look in her eyes already showed it was a bad idea. “Oh, Dlaw, I am so sorry but I have to be at my boyfriend’s place in Maryland for 7.30”. What about tomorrow I say. “Oh sorry again Dlaw, I would still be at his place”. And next week, I try one last time. “I am sorry Dlaw, but I don’t think I would be free”. That’s the last thing I heard as she got into her car and drove off. 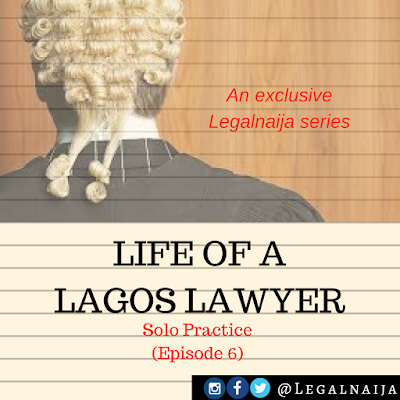 Join us next weekend for another episode of “Life of a Lagos Lawyer”. An exclusive Legalnaija series. PLESE NOTE: This is a work of fiction. Names, characters, places and incidents either are products of the author’s imagination or are used fictitiously. Any resemblance to actual events or locales or persons, living or dead, is entirely coincidental.